The iROBO-4845G-ISA industrial computer was designed to solve a wide range of tasks in data collection application scenarios. The system is also great for the processing and storage of information in various industries with increased requirements regarding dust and moisture protection. It is easy to operate and is protected against sudden system failure. If necessary, any modifications of the system are available on request. The iROBO rackmount industrial computer is based on the Intel® Pentium chipset with 400/533 MHz FSB, and supports Intel Pentium 4-M, Intel Celeron and it is based on Intel 82845GV Chipset. There are two DIMM 184-pin slots for DDR 266/333 for the expansion of the memory. For saving and processing information the system supports up to 4 HDD 4E IDE devices. It is possible to connect a large number of peripheral devices to the computer with interfaces used in industrial environment – serial port via RS232, four USB for data connectivity and two LAN ports - 1x 10/100 Fast Ethernet and 10/100/1000 Gigabit Ethernet. Furthermore, the system offers onboard 8-bit GPIO, SM bus and a parallel port. The iROBO-4845G-ISA has a lot of expansion slots – four PCI slots and three ISA slots to install additional modules (expansion cards) to extend the configuration of the system. 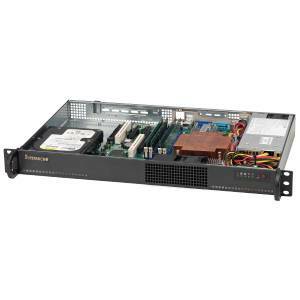 The power supply of the rackmount industrial computer delivers up to 500W. How to create a RAID array on an industrial computer?